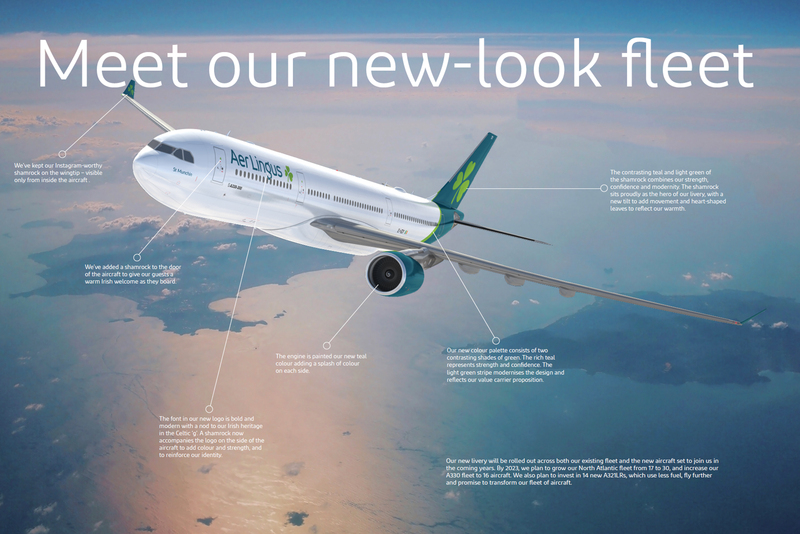 'I'm delighted to present our brand refresh, which comes 20 years after Aer Lingus last invested in new brand livery, and reflects our position as a modern airline. We have evolved from an Irish airline that flies internationally to an international airline that is proud to be Irish. In addition to the new brand identity and livery, we will also unveil a new uniform later this year and will welcome new A321LRs aircraft to our growing fleet. The re-imagining of the Aer Lingus brand reflects Ireland in 2019. A society that is open, progressive, liberal, outward-looking and dynamic, an Ireland that is proudly European and has become the destination of choice for inward investment. The shamrock retains pride of place within our new look and livery. Our research at the start of this project quickly confirmed what we all felt - that our beloved shamrock should be integral to any new design. The Irish emblem has been at the heart of the Aer Lingus brand for more than 80 years, and it will continue to sit proudly across all of our aircraft. We have restyled the shamrock to represent the values and future of Aer Lingus - our modernity, confidence, optimism and strength. The tilt symbolises our dynamism and speed. The stem keeps the shamrock recognisable and strong. And the heart-shaped leaves reflect the warmth and hospitality of our brand. You'll see four shamrocks on the new livery. The first is within our new logo, the second sits on the tail fin, a third welcomes guests at the door, and a final surprise awaits on the wingtip. As our new look takes off in 2019, the shamrock will continue to fly high as the hero of Aer Lingus. Let's take a closer look at the key design elements of our new livery. The new look reflects our position as a modern international airline, while at the same time maintaining our rich Irish heritage. We've added a shamrock to the door of the aircraft to give our guests a warm Irish welcome as they board. The font in our new logo is bold and modern with a nod to our Irish heritage in the Celtic 'g'. A shamrock now accompanies the logo on the side of the aircraft to add colour and strength, and to reinforce our identity. We've kept our Instagram-worthy shamrock on the wingtip - visible only from inside the aircraft. We can't wait to reveal our brand new uniform later this year. It's been 20 years since we introduced a new style and we've got renowned Irish designer Louise Kennedy on board once again as our designer. We're delighted to be opening our first dedicated lounge in Boston Logan Airport in 2019. Guests will be welcome to relax in the new space - which is being designed to include all of our refreshed branding. We're looking forward to welcoming our first Airbus A321neo LR to the family in 2019. This more environmentally-friendly aircraft, with lower CO2 emissions, will also sport our new branding on the interior.